On a cold damp dreary Thursday night, Yes brought their latest tour to Massey Hall in Toronto. The show was the bands next to last on this first leg of their tour. While the band has had many incarnations throughout its existence, the core of drummer Alan White, guitarist Steve Howe and bassist Chris Squire have been the bands most stable members in recent years. Rounding out this particular lineup were keyboardist Geoffrey Downes and singer Jon Davison. The band had chosen to try something it has never done before and that is play three albums in their entirety. With an early 7pm start time, the band started off with Close To The Edge in what many regard as the best Yes album. Originally released in 1972, the album still remains the bands’ highest charted album as it climbed to #3 on the Billboard Album Charts. At the centerpiece of the album is “And You And I”, a wondrous track that consists of four movements. Up next came perhaps the least heralded album of the night 1977s Going For The One. While songs from this album rarely appear in the bands set lists, the diehard fans in the crowd enjoyed the rare treat. The highlight came in the form of “Awaken”, a track former lead singer Jon Anderson considers Yes’ most complete composition. This show was the first I was able to see with Davison at the vocal helm and I must say he seemed to have more stage presence than his predecessor Benoit David. Davison also sounded very good vocally as he was heard clearly and sang the songs as they should have been performed. After a brief twenty minute intermission the show continued with the bands classic 1971 release the Yes Album. The band has been mixing up the playing order of the three albums throughout the tour. The arrangement that was performed on this particular night was the one I envisioned working the best. The band did not disappoint. The Yes Album was the first to feature guitarist Steve Howe. Howe was left alone on stage to perform “Clap”, an acoustic instrumental piece that received an extended ovation at songs end. Howe at sixty-six years old can still play guitar at an extraordinary level. He also drew the biggest response from the crowd when each member was separately introduced. Howe had recently left his other band Asia so he can focus more on Yes and other solo projects. As the band played through The Yes Album, other highlights were “I’ve Seen All Good People” and the crowning track “Starship Trooper” which was the song of the evening. The band came back for an encore of “Roundabout” and left the crowd wanting more. As the band came together at the front of the stage, the thunderous ovation was one that stood out over recent memory. It appeared the band was overwhelmed as they soaked in the adulation. 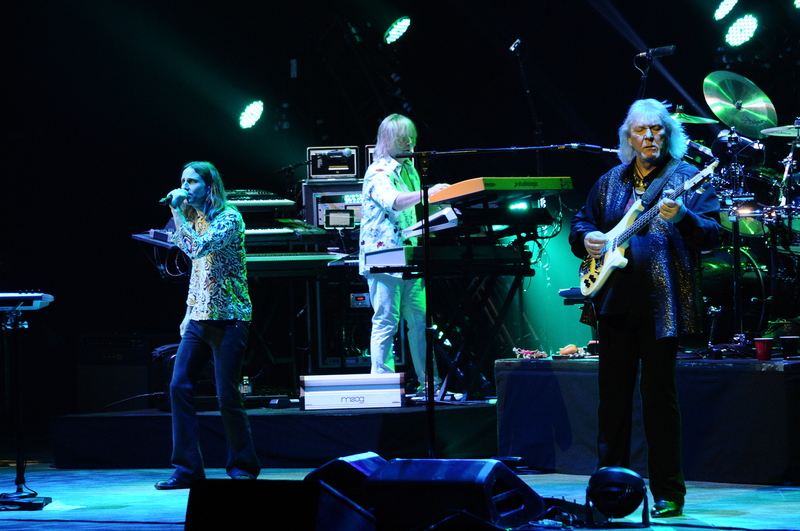 Yes fans were treated to what clearly stands out as the best tour by the band since their thirty-fifth anniversary tour back in 2004. Sometimes if you change the personnel it works, sometimes it doesn’t. On this particular evening the band played like a fine wine that continues to get better as time goes on.